Hot Wheels #Promotional Vehicles seem to be on the decline as of late. As evidence by THIS LIST on SouthTexasDiecast.com, you’ll see that in the late ’90s and in the ’00s, we saw a flood of promotional vehicles for a good variety of corporate partners. Even the partnership between Hot Wheels and Major League Baseball teams seems to have run dry. The San Diego Padres, who seemingly released a car just about every year, haven’t had a promotional Hot Wheels vehicle since 2010. We can only speculate as to the cause behind the lack of promotional Hot Wheels these days, as it could be any combination of the following: higher costs to corporate partners, change in direction of the Hot Wheels brand (meaning they just don’t seek promotional partners anymore), brands seeking other avenues to reach children OR some other unknown. Instead of continuing to speculate, lets go back to the beginning of the golden era of Hot Wheels promotional vehicles, 1994. Shell partnered with Hot Wheels to produce 4 vehicles from 1993 to 1995. Originally released was the unlicensed Hot Wheels exotic sports car Zender Fact 4 in 1993 with Shell logos. The Purple Passion (in yellow, seen below), followed suit when it was released in 1994. The last two vehicles were released in 1995 (Bywayman & Turbo Streak). 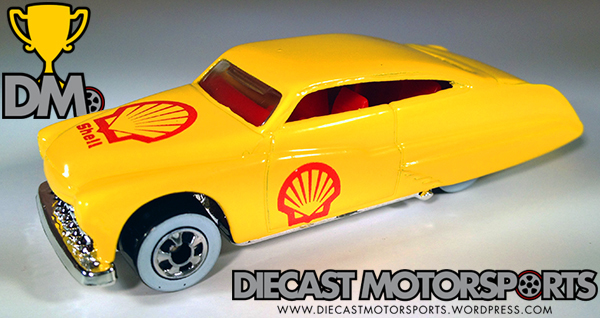 While the details are a little fuzzy (and correct me if I’m wrong), you could obtain these Shell promotional vehicles by purchasing them for a nominal fee with any gas or oil change purchase at Shell gas stations in the United States. These are, by no means, hard to find in this day and age as I recently was able to score the 4-car set for $10-shipped (all in their original baggies). To me, the Purple Passion is the pick of the litter as the casting is not only the most popular of the four but its simple, “classic” paint job with Shell logos looks like the owner’s (of the gas station) custom car–used in a classic picture-esque 1950s “billboard” promotion as its parked out front of the 2-pump gas station. The Hot Wheels Purple Passion has had a long casting life as it was introduced in 1990 after Hot Wheels Designer Larry Wood designed it as a custom version of a ’49 Mercury. Its tenure has produced many versions and there is no shortage of that stopping as it is a favorite among collectors. RELEASE DETAILS: Yellow Enamel Body (metal). Clear Windows. Red Interior. White-Wall Tires on Chrome Basic Wheels (BW). Chrome Base (plastic). Made in Malaysia. Released in 1994 as a Promotional Vehicle for Shell Gas Stations. For more images of your favorite Hot Wheels cars, check our @orangetrackdiecast on Instagram!